Eight women met at the Meetinghouse for our December Meeting. The program was presented by Angie Reed on “How do we keep Christ in Christmas?” from the Blueprint book for 2017-2018. The secretary and treasurer reports were presented by Nancy Marstaller and accepted. Prayers were requested for Muna Khleifi from the Amari Play Center. The Tedford meal for November was corn chowder, shepherd’s pie, a large green salad, and a desert. Christmas bags were prepared and distributed for delivery. The donations from the Mitten Tree were totaled. Donated were 3 scarfs, 14 hats, 3 pairs of children’s mittens, 5 pairs of adult mittens, and 15 pairs of adult gloves. The warm items for cold weather were donated to Hope Haven in Lewiston. It was decided that we will have a silent auction prior to our January meeting on January 21. The January meeting will be held at the Meetinghouse at 6pm, more details will follow. Prepared by Finance Committee; approved by the Meeting, December 18, 2018. Monthly Meeting for Business has endorsed the Peace and Social Concerns Committee request for a special meeting to take place after regular meeting for worship on Sunday, January 6. The meeting will be convened by Lesley Manning and Bob Eaton for a focused response to the American Friends Service Committee request for Friends’ discernment on what programs the AFSC should focus on in the next ten-year strategic plan for the organization. Bob will prepare brief (but insightful!) background materials to be available before the meeting. Here is a brief description of current AFSC Work that may be a useful reference. Durham Monthly Meeting of Friends convened in worship for the conduct of business on Sunday, December 16, 2018 with 13 persons present. Clerk, Susan Rice, opened the meeting by reading a quote by Howard Brinton from the Pendle Hill Pamphlet #453 by Elizabeth Meyer: A Practical Mysticism. The November 18 minutes were approved. Ministry and Counsel: Martha Hinshaw Sheldon reported that at their December meeting they discussed pastoral care concerns and reviewed meeting for worship. They will be supporting Liana Thompson Knight with her leading to offer seminars based on her training with Parker Palmer and ideas expressed in his book, Healing the Heart of Democracy. Doug Bennett reported that M&C has prayerfully considered ways to bring greater continuity to our worship. They would like to encourage having a theme for our worship that would change every three months, using themes not as a strict rule but as encouragement and stimulus. They suggest that committees also suggest possible themes. They suggest the theme from January to March be: “Where Are We Being Led?” See the attached proposal and their suggestions in the newsletter. Diane Dicranian will be speaking in meeting on December 30 regarding her experience on the Mexican border. See details in the Newsletter. We expressed our gratitude to Ministry and Counsel for their thoughtful report. Finance Committee: Katharine Hildebrandt presented the proposed budget for 2019. She noted that there are added lines for Youth Minister Travel Fund, Clerks Committee, and mouse elimination. Also, is an increase to repair/maintenance lines for the meetinghouse and parsonage. They report a total revenue expected for 2019 to be $58,015 and projected expense of $57,800. The complete report is attached. The budget for 2019 was approved, with the correction that the Newsletter Committee is now the Communication Committee. Nominating Committee: Margaret Wentworth reported that a final report will be forthcoming with additions and adjustments. The Clerks Committee will be added to the list. We approved the Nominating Committee report as presented. We approved that Susan Rice continue as Clerk, and Dorothy Hinshaw, as Recording Clerk. Christian Education Committee: Tess Hartford reported that a wonderful Christmas dinner/worship on December 15th was enjoyed by many children and adults (more children than adults!). Katherine Langelier will begin as clerk of the committee 1n 2019. We expressed appreciation for Tess Hartford’s commitment and leadership as Christian Education Committee clerk for six years, and gratitude for the committee’s work. They announced that a Family Game “Night” will be held January 12 at 3:00. 9 Trustees: Susan Rice reported that the parsonage is being rented to Juliana Vezina and Jamison Steele. The ceilings are being repaired in both the kitchen and community room. We approved reimbursing Donna Hutchins for the $150 expense of a water test in the parsonage. Clerks Committee: Susan Rice, clerk, reported that the Clerks Committee is proposing to have welcome dinners for new attenders. Peace and Social Concerns Committee: Bob Eaton reported that on January 6 they are planning to have an after-meeting discussion about the American Friends Service Committee. A relevant pamphlet will be distributed to aid in the discussion. Details will be included in the Newsletter. The meeting closed in quiet worship. We will have our next Family Game “Night” on Saturday, January 12 beginning at 3 p.m. Please join us. Durham Friends of all ages have enjoyed these nights. Like many of you, I wake up grateful for a new day and a desire to treat others with love and respect. The past few days I have heard birds singing despite the snow! And then I listen to the news and am saddened and angry about what is happening to the children, people of color, the immigrants, refugees, veterans, our food, the earth’s atmosphere, the animals, the list goes on and on. I wrestle with the questions: To what burning issue should I give my energy? How do I make that decision? How do I hear God’s voice? How do I structure my day-to-day activities, fit it all in, with the important work of helping our world? This is my current spiritual dilemma. Last year, two messages helped me find balance. Maggie Edmondson talked about the importance of breath – breathing in and breathing out – both equally important for life. We become still and centered, breathing in spiritual strength, then need to breathe out using that strength to do good work. We can’t take another breath in without emptying our lungs. We need spiritual strength to do good work. Then, we need to be out in the world to activate our spirituality. Craig Freshley called finding balance “savor and save”. Here is this concept in my own words: We become still, savoring the lovely, the beautiful, and then have energy to attend to whatever needs saving. examining the scourge of white supremacy in our Quaker culture and practices. I have valued immensely the discernment of the people gathered to bring focus to these two problems. We have taken steps to work on this and I am grateful to be in a community that takes these issues seriously. I have found this focus helpful as I wrestle with how to decide where to put my energy. How do we find balance in our Durham Friends community – breathing in as well as out, taking time to both savor and save? Friends Committee on National Legislation is a lobbying organization in the public interest founded in 1943 by members of the Religious Society of Friends. FCNL works for social and economic justice, peace, stewardship of the environment, and good government in the United States. FCNL asked Meetings to discuss the content from the booklet The World We Seek. In addition, Durham Peace and Social Concerns committee wanted us to read this as a Meeting. They asked us to consider a focus area and gather at a special meeting in March of 2018 to discern “what stirs the heart of Durham Meeting,” what issue calls to us to WORK ON TOGETHER, as a corporate concern or project. In this booklet are 4 areas. After reading the booklet, I resonated with everything mentioned… and felt totally overwhelmed by the scope of changes needed to bring about the world we seek! So, the questions: What issue rises to the top and how do we choose where to put our energy as a Meeting and individually? How do we find balance? What’s the value in addressing an issue? What’s the harm/risk if we don’t? I struggle with the knowledge that even having this choice is a privilege. I don’t experience the terror of war in my neighborhood or state and have never witnessed war and its aftermath. I am free to travel and work and walk through my community free of the harassment that many others feel daily. I had a good education, a good job with a spacious house and yard, and clean water to drink, good food, good health, good friends. I do not experience the impending fear that tomorrow my life may be in ruins. I feel impelled to work for change because I see the signs that our society and world are being irreparably harmed. As those who try to base our actions from love and the belief that there is that of God in everyone, how do we answer that call? I also feel weary, because there are so many wrongs that need to be righted. Without a focus, expending energy on all these issues is not sustainable. What is rising in your heart? How will you find balance? I will close with the words from a song by Donovan from the movie Brother Sun, Sister Moon about St Francis of Assisi. “Do few things and do them well” has become a mantra for me, a goal that is currently out of my reach, but my hope for the future. To what should we be “open and alert?” What are the new directions that the Spirit may be leading you, or leading us? You may find useful the opening paragraph of Paul Lacey’s Pendle Hill Pamphlet Leading and Being Led. So, again, where are we being led? Our past two years it has been rich and challenging to have Sunday messages brought by various people. This has also deepened our connections to one another. Many of us have appreciated when there have been a series of messages around a single theme or topic. Sometimes those messages came when we had a pastor, other times when a member felt called to speak several weeks in a row. The Meeting’s Committee on Ministry and Counsel has prayerfully considered ways to bring greater continuity to our worship. We would like to encourage having a theme for our worship that would change every three months. We ask that Durham Friends Meeting use these themes we propose as encouragement and stimulus, not as a straightjacket or as a discouragement of other messages that arise within the Meeting. Messages that do not fit the theme will continue to be most welcome. Each few months we plan to propose a theme for worship and circulate it among Meeting members. Members of Ministry and Counsel will use the theme in our care of worship activities: we will use the theme to select a reading or a reflection, for example, to open worship. We encourage Meeting members to consider whether they have a message to offer that arises from or speaks to this theme. We also encourage other committees of the Meeting to suggest possible themes for our worship. Diane Dicranian recently spent time at the militarized border between San Diego, California and Tijuana, Mexico in a protest organized by the American Friends Service Committee called “Love Knows No Borders – A moral call for migrant justice.” Thirty-two people were arrested in that protest. There will be a pot-luck lunch directly following worship and a program in which Diane will share with us what she experienced and learned in her time at the U.S.-Mexico border. She will talk about U.S. involvement in Central and South America over past decades and how that has created some of the desperate conditions that lead families to flee their homes and seek refuge in the U.S. She will also talk about the caravan of refugees that has been making its way through Mexico towards the U.S. border. Should they be greeted as we have been taught – to reach out and love the stranger, opening our doors and feeding these people? Or should they be met (as they are) with teargas and machine guns? She’ll also challenge us to consider next steps in bringing this conversation to action. The Christmas Program will be on Saturday, December 15, gathering for worship and a turkey dinner. Come at 4:00 to help prepare the meal and set up. Worship, sharing of poems, songs or personal stories will be at 5:30 with dinner to follow. The final report of the Paid Position Working Group will be presented to Monthly Meeting this Sunday, November 18. 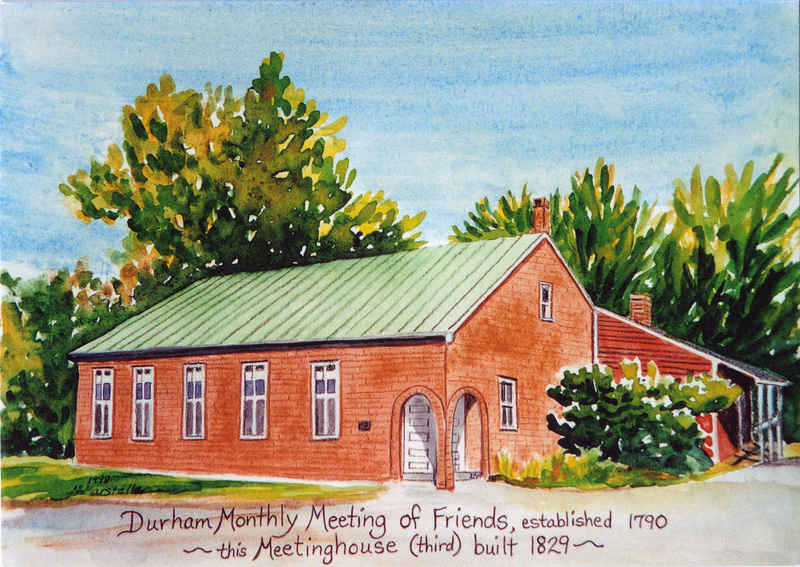 The members of the Working Group, which has focused on the larger question of Strengthening Durham Friends Meeting, are Doug Bennett, Joyce Gibson, Theresa Oleksiw, Sukie Rice, and Wendy Schlotterbeck. A compilation of the Working Group’s earlier progress reports to the Meeting can be found here. Please share the news and joy from NEYM Sessions 2018 with Friends at home. Consider posting these talking points and making a report to your local meeting for business. The theme for this year’s Annual Sessions was In Fear and Trembling Be Bold in God’s Service. During the plenary session we heard ministry from Adria Gulizia (Chatham Summit, NJ-New York Yearly Meeting), Sarah Walton (Vassalboro, ME) and Meg Klepack (West Falmouth, MA) sharing experiences from their journeys of faith. Diane Randall (Hartford, CT), Executive Secretary of Friends Committee on National Legislation (FCNL) spoke in the Bible Half Hours each day about the role that her faith has played in her work in the political sphere, and the ways in which the practices of Friends have influenced public policy. Recordings of the Bible Half Hours and the plenary session will be available soon online at neym.org and on the NEYM YouTube channel. Of the more than 620 people gathered, close to 15% were attending for the first time. For the third year in a row youth attendance was at a record high. We continued to celebrate strong representation from each of the New England states; from visitors including Friends from Kenya, Bolivia and El Salvador; and from several other North American yearly meetings; as well as ecumenical representatives. Though we mourned the U.S. government’s continuing denial of visas which prevents representatives of our Cuban Quaker family from being with us in body, we felt their presence with us through a series of video clips, which captured their greetings and prayers for us. They were with us in Spirit. Throughout the week Friends gathered at Castleton University engaged in a continuing conversation about the need to identify and interrupt the patterns of seeing and doing– within each of us, and within New England Yearly Meeting–that lead to complicity in white supremacy and oppression. The need for this continued work was identified in committee reports, during several items of business, in ministry during our sessions and worship, in the writing and approval of minutes and in ongoing conversations among small and large groups of Friends. We-as individuals, in our meetings, and in our organization-must continue this conversation. We must continue to follow the Spirit wherever it leads, trusting in the Grace that is with us always. Continuing Support for Immigrants and Refugees: Friends shared news of the responses to Sessions’ minuted commitment (Minute 2017- 42) to support the rights and dignity of all 2 of our neighbors who are threatened in this time, including especially undocumented immigrants, refugees, and Muslims. We heard about some of the myriad ways that Friends and Friends Meetings throughout New England have been responding to this commitment. Friends approved the formation of an Immigration Justice working group to bring together Quakers across New England who are under the weight of this concern, and committed the support of the yearly meeting to this group. If Friends in your meeting are engaged in ministry in support of these concerns and would like to connect with others similarly involved, please contact the Yearly Meeting office at neym@neym.org. Continuing to Respond to the Climate Crisis: At the recommendation of the NEYM Earthcare Ministries Committee, those gathered affirmed a commitment to using the Cape Cod Climate Change Collaborative’s carbon calculator to calculate their carbon footprint and commit to a 10% reduction from baseline measures this fall by December 2019, and to encourage Friends throughout New England to do the same. More detailed information on support for this work will be forthcoming from the Earthcare Ministries Committee. Prohibition of Nuclear Weapons: Connecticut Valley Quarterly Meeting brought forward a minute asking that the Yearly Meeting “…encourage Friends in New England to seek ways to support [the 2017 United Nations Treaty on the Prohibition of Nuclear Weapons] and… inform people about it.” Friends approved sharing this minute with local and Quarterly Meetings. Criminal Justice Reform: Salem Quarterly Meeting asked Sessions to support a minute stating their “…support [for] comprehensive criminal justice reform in Massachusetts that will promote restorative justice, support alternatives to incarceration, reform the pretrial process, and reduce the criminalization of poverty and race.” The minute further invites Friends, and meetings across New England to “join [Salem Quarterly Meeting] in the work of repairing and restoring our communities by reforming our criminal justice system.” Friends affirmed this minute as well seasoned, and asked that the Clerk share this minute with other quarters for discernment and further action. Faith and Practice Revision: As part of the Yearly Meeting’s ongoing process of revising the book of Faith and Practice for Quakers in New England, Friends considered a draft paper on Membership. Important questions arose, including consideration of the effect that approving a practice of dual membership might have on our understanding of the core commitments of our tradition. Two additional draft papers were presented for comment–one on Pastoral Care and one on Death, Dying, and Bereavement. Meetings are encouraged to further engage corporately with the material presented, and to share with the Faith and Practice Revision Committee what unity and wisdom they receive, trusting in the guidance of the Spirit in our midst. The draft chapter on membership is available here. For further information, or to share your meeting’s responses, contact Phebe McCosker (Hanover, NH, Friends Meeting), Clerk of Faith and Practice Revision Committee, or visit neym.org/fprevision. Transforming our Relationship with Money: After five years of dedicated and faithful work, its charge fulfilled, we celebrated the laying down of the Ad Hoc Long Term Financial Planning Committee. The Finance Committee’s proposal of a balanced budget for the coming fiscal year–the fruit of a diligent process including both expense reductions and increased income–included a reduction of the total amount of New England Yearly Meeting’s donations to three of the organizations of which NEYM is a member (Friends United Meeting, Friends World Committee for Consultation, and Friends General Conference). This provided Friends in attendance an opportunity to engage with the dynamic tension between our responsibility for fiscal stewardship, and our responsibility and commitment to support the work of the wider Quaker movement of which we are an inextricable part. After much discernment and with a sense of God’s continual provision, Friends approved maintaining our current level of support for these three organizations, recognizing that further increases in contributions from meetings and individuals will be needed to prevent a deficit in the coming year. Further details, video & audio recordings are posted at neym.org/sessions. Minutes of Annual Sessions will be posted soon and distributed to all local meetings. To receive news and updates on the life and ministry of Friends across New England, subscribe to the monthly email newsletter at neym.org/mc-signup. New England Quakers also have an active and growing presence on social media through Facebook, YouTube and Instagram. The next Annual Sessions will be held August 3-8, 2019 at Castleton University, in Castleton, Vermont. For questions or more information about anything mentioned in this document, contact neym@neym.org. My mom (Clarabel) and I are still collecting commemorative stamps. A group of Friends collects them and prepares them for sale to collectors. Money raised goes to various Friends organizations. There is a box on the library table for your stamps. Please cut them off the envelope with about ¼ inch around the edges (unless it is a special postmark) and don’t try to soak them off the envelope. We’ll send off what we’ve collected after the first Sunday in December: 12/2. But don’t stop saving them! We’ll keep sending off what we have a few times during the year. For the last couple years, I’ve been reading to understand how racism has affected the attitudes and actions of myself and others. It’s been a saddening and sometimes shocking journey to learn of the experiences of many people of color, and how entrenched personal and institutional racism is. This book is well written and challenges us to understand ourselves better and pursue racial justice. I’ll donate it to the Meeting library so that others can learn from it. Racism and white supremacy are attitudes that affect us all, whether consciously or unconsciously, and have terrible negative effects all through society. Join me as I continue to uproot prejudice in my heart and mind and find actions to uproot racism in society. A message given at Durham Friends Meeting on October 21, 2018 by Craig Freshley. Craig records all the messages he gives and posts them on a website, Craig’s Quaker Messages. You can listen to this one here. You are invited to a pot-luck dinner to join Pastor Ida, Administrator of the Kakamega Orphans Care Centre on Monday, November 5 at 6:00 p.m. at the meetinghouse. After the meal, Ida will bring us up to date with changes happening with the Care Centre programs. He will share personal reflections on his own work as it, and his thinking and understanding has evolved. This will be more of a conversation with old friends, rather than a slide presentation. Bring a favorite dish to share. Questions: Sukie Rice, 318-8531. I am glad to recognize the continuing debt we owe to the original people of our area; Casco Bay and beyond. I am relieved not to recognize C. Columbus, who practiced severe genocide and never stepped foot on North or South America. I am aware that Norsemen and fishermen had traded with people in our area prior to 1492. They did not invade in the 1400s but for the most part, visited and let the indigenous people be. After I was alerted through Peace and Social Concerns Committee, I attended a workshop by Ralph Greene, publicized by New England Yearly Meeting, held at Vassalboro Meeting. He interpreted multiple bible passages and incidents from Quaker history to develop his conception of “ the lamb’s war”. To condense these 2 hours, I’ll share that this is in reference to speaking truth to power and being faithful to leadings even if risk or danger of violence or possible sacrifice is involved. Ralph lectured that Papanuhang was a man of the Mohegan people, whose tribe was decimated by settlers with rigid ideas (such as Puritans) and US government policies regarding “the Indian problem”. Despite this, he was part of a small group that left their Connecticut homeland and went to live with a related tribe in the Delaware region, the Lenape people. This was a move to survive. He was able to establish a peaceful cooperative settlement for several years and negotiated prisoner of war releases and avoidance of bloodshed on occasion. Ralph had a distant relative from the Mohegan people. This achievement by Papanuhang is remarkable and speaks to this indigenous man’s spiritual strength, as he was already battling alcoholism and in contact with others who were too. I attended a film and discussion sponsored by Wabanaki Reach, at the UUC in Brunswick. There are several of these groups in Maine and several local Quakers are involved. These groups are an attempt by native Maine people (collectively referring to themselves as Wabanaki) to educate all of us “ from away” or not native… another term is settlers. This was a film about the Dann sisters, two elderly women living a traditional ranching life on land they were deeded and open range ranching on land of their tribe, the Western Shoshone people. They were put out of business by annulment of the tribe’s treaty rights by, “ gradual encroachment”, sad but true. Their niece was present to be part of the discussion that followed. I saw the images of multiple open pit mines on their land and the taking of their horses and cattle, which ensued, to represent the very worst of our present culture, greed got the upper hand and the suffering was monstrous . I am told by native Mainers (Wabanaki) that they want those of us who are not native to educate ourselves about all that has happened as our ancestors and as present-day non-native people interact with the remaining native population. There is much to reflect on as our governor has signed an interpretation of the Maine land claim of the 1980’s, stating the Penobscot tribe has no right to monitor and protect the health and safety of the Penobscot River. This is working its way through the courts. Will the outcome be fair, will it be in the best interest of all the people of Maine? Will it uphold the treaties? Will it help to protect the quality of water in one of the major rivers here in Maine? I understand that the Penobscot people consider this river to be the lifeblood of their tribe. Much to learn, to contemplate, to discuss and act on. Member Janet Douglas, the mother of Jim Douglas, a member and former pastor here at Durham, passed away on September 10. Her life will be celebrated in a memorial service at the Meetinghouse of Durham Friends on Saturday, November 10 at 11:00 a.m. All are welcome to join the Douglas family.